We love just about any kind of Mexican food at our house. When I’m struggling to come up with something for dinner, I usually fall back on tacos or quesadillas. They’re fast and everyone will eat them, mostly because I can easily make them in the individual picky way for each kid. We’ve made taquitos before, with great success. I even made a bunch before I had my last baby and kept them in the freezer, ready to pull out for a quick meal. Sometimes we bake them and sometimes we semi-fry them. It’s probably just as bad as frying, but it makes me feel better because I’m not completely drenching the poor taquitos in oil. We like them both ways. And these have the perfect kick! They’ve got just enough spice to make you want to dip them in something creamy. My husband brought out some of our Creamy Jalapeño Dip, which I thought would be too spicy. But the chipotle and the jalapeños seem to just work together really well and balances things out nicely. We also have sour cream fans and even ketchup dippers in our family. Don’t judge. They’re super yummy for dinner, or a snack or as an appetizer for your next gathering. Place cream cheese in a bowl and add spices and stir to combine. Add chicken and stir until mixed thoroughly. Heat 2 tablespoons of oil in a large pan over medium high heat. Take tortillas 4 at a time and microwave them for about 15 seconds, or until heated through and easier to work with. 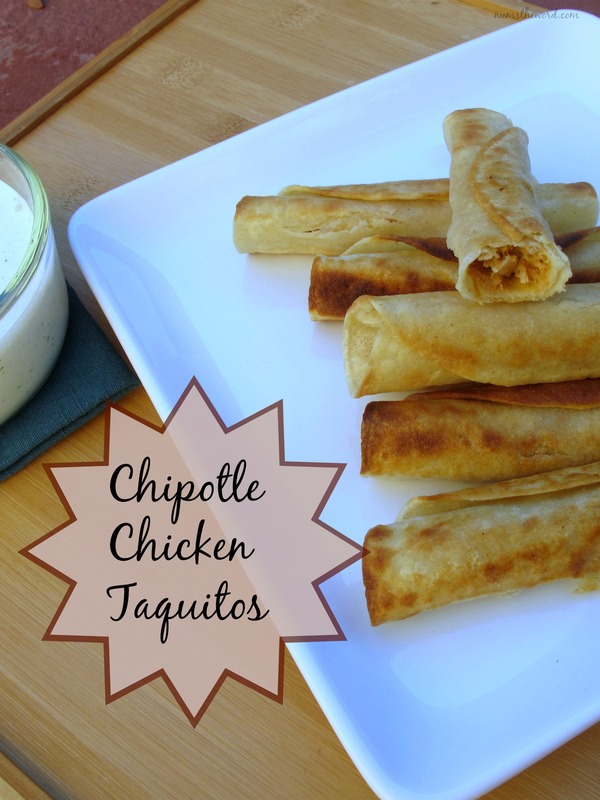 Place about 1 tablespoon of the chicken mixture on each tortilla and roll each one tight. If needed, secure with toothpick. Then place in the pan, seam side down. I can usually get about 4 in a pan at a time. After about 2 minutes or until golden, flip over using tongs, and cook for another minute or until golden on that side. Remove from the pan and place on paper towel lined plate to drain excess oil. Then transfer to a baking sheet in the oven set at 250 degrees to keep warm until all are cooked. Continue cooking until all are done, adding more oil as needed in between batches, a few tablespoons at a time. Serve with guacamole, Creamy Jalapeño Dip, or any other condiment of choice. You can also very easily bake these instead of frying them. Preheat oven to 425, then fill and roll as instructed and place on a baking sheet seam side down. Spray them lightly with cooking spray and bake for about 15-20 minutes or until they begin to brown. Looking for something a bit different for taco night? These grilled chicken tacos sure hits the spot. 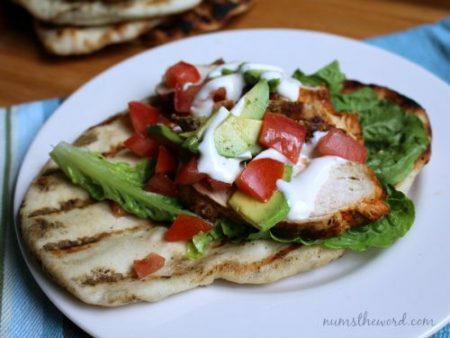 Made with grilled flat bread and marinated chicken! Have you had Winger’s sauce? Well, mix it with ranch and it becomes their Creamy Amazing. 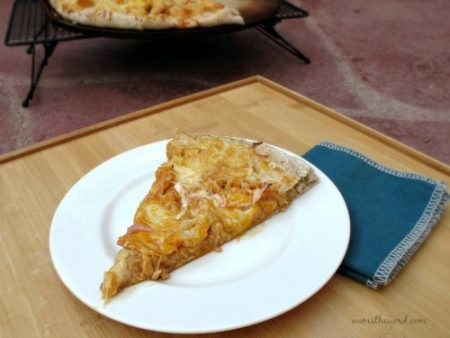 That was the inspiration for this pizza, which is one of our favorites, and also pretty easy to put together! 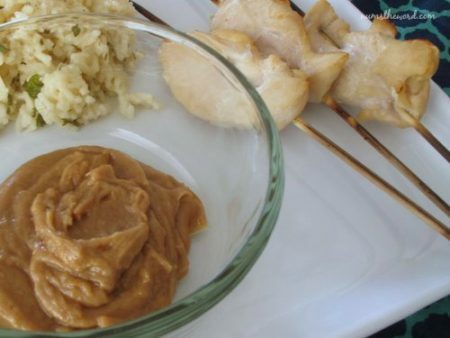 Lime marinated chicken is dipped in simple, delicious peanut sauce. Mmmm – and this yummy Thai inspired dinner comes together in just 20 minutes!